Why Does Wal-Mart Hate America? 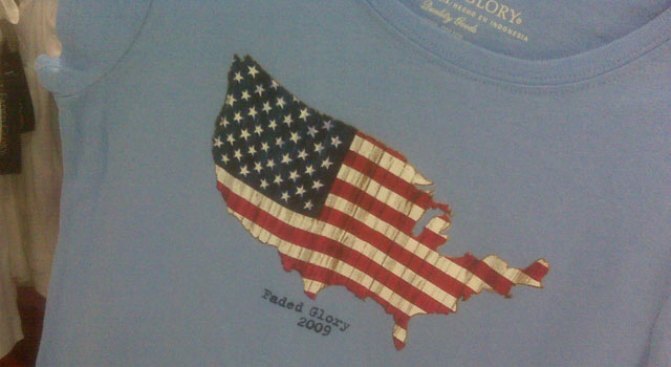 A "Faded Glory" T-shirt from Walmart. Whose glory has faded? "Faded Glory" is Walmart's clothing brand, a cheap-but-comfortable answer to Old Navy. The brand name seems fine on a tag. But it makes an odd political statement when you print it below the American flag, especially for a retailer associated with red-state America. Many have already taken aim at the clothing line for their quality, or lack thereof, and foreign manufacturing. The brand has been around for decades, so perhaps it's unfair, but there does seem to be some subtle irony in the message conveyed by this t-shirt. What do you think? Is "Faded Glory" unpatriotic? Have your say in the comments.